People are always asking what I miss about the US or what I love about Italy and my answers tend to vary with my mood. But, I have officially decided one thing that I absolutely love about life in Italy and Europe in general-- day trips! 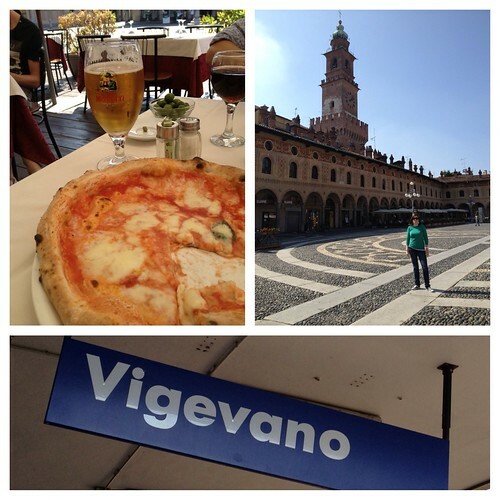 This past Saturday Kate and I took a train trip to Vigevano, Italy. It's probably only 30 minutes by car, but takes more like an hour and a half to go the round about way from the small town of Opera. We hopped on our bikes and pedaled down to Locate (lose the English pronunciation and give it three syllables), the next small town south of us. They have a train station. 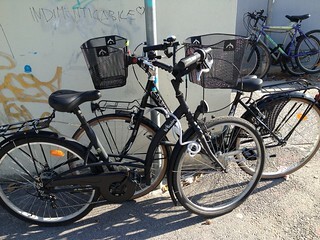 We locked our bikes, took a picture for posterity, and prayed that they'd still be attached to the pole upon our return. Bike theft is just a bit of a problem around here. Thought I'd snap a pic just in case it was the last time we saw them! So we took the train from Locate to Pavia, and switched at Pavia to a train heading to Mortara (I'd never heard of this one before), and at Mortara switched again to get to Vigevano. It took about an hour and a half. Vigevano has a long history in this part of Italy, primarily because the Duke of Milan, Ludovico il Moro, had a castle built here as part of his noble residence. The center of the city is quite picturesque, with a cathedral at one end of Piazza Ducale and the castle and tower sitting beside the piazza. We climbed the castle's tower, which unfortunately didn't allow you to climb very high, and toured the Museo Internazionale della Calzatura (aka shoe museum), which sounded much grander than it was. 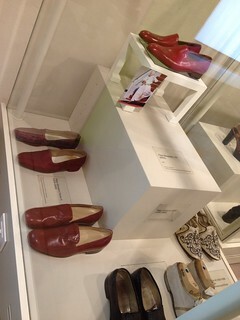 but somehow I doubt that this little museum would have such a treasure. We ate Napolitano style pizza, reminisced about eating the real thing in Naples a few months ago, and sampled a gelato that reminded us of cookies and cream ice cream. Not a bad day at all. It got better when we returned to find our bikes where we left them. Yes! As for things I miss from the US? Tonight it's that delicious frozen garlic bread you can buy at the grocery. 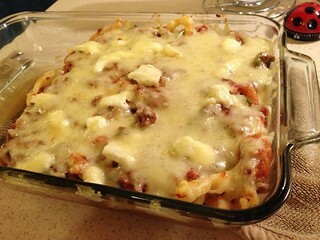 I made this yummy pan of baked tri-color pasta and was thinking how nice a slice of that greasy garlic bread would have been. Plenty of leftovers...who's coming to dinner tomorrow? Finally, a special shout out today to my friend Becky (Nease) Johnston to let her know that I'm thinking of her today as Kyle deploys with his unit to Afghanistan. Keeping you both in my prayers! Love you! I'll be there shortly for dinner!! Hi Carrie! It sounds like you are having a wonderful time. I wish I could be on those trips with you! I just went on a cruise to the Bahamas, so I can't complain though! Thanks for blogging about your experiences.